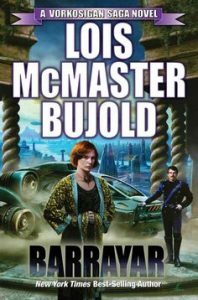 … and I thought, Can it be that a Vorkosigan book by Lois McMaster Bujold got a good cover? Is that even possible? But I do think this is pretty good! Cordelia is maybe a little young-seeming, but still. I like the bag she has over her shoulder, and I like the scene itself, and generally I just like this cover. 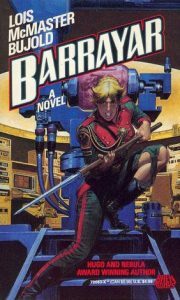 So I thought it would be interesting to compare it to what turns out to be a whole lot of other covers that have adorned Barrayar over the years. I never understood this cover. Is that supposed to be Cordelia? Surely not? But what is Drou doing on the cover, in a weird scene that I don’t think ever took place? Let’s take a look at some more, which I think range from boring (generic spaceship cover) through just weird (that white one) and possibly okay but misleading (the swordstick raised up to strike) and oddly pensive but not actually bad. What do you think? My vote for best of the lot is the first one, the one I saw at tor.com. My vote for the worst is the one on my own copy, the strange blond woman with the sword stick. Or maybe the white one, which has totally the wrong feel for the genre as well as being wrong for the actual book. Previous PostBook Riot: Seven Standalone Fantasy Novels	Next PostJust how impressive is YOUR English vocabulary? Oh, that is actually a decent cover! That white one though. Is it the shadow of Count Piotr??? I mean, WHAT and also WHY? I will not embark on a massive Bujold reread. I will not. All my unread library books are yelling at me. 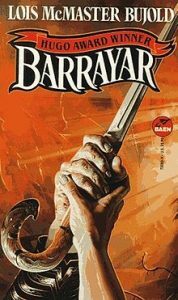 Ha ha ha, I know, I want to go re-read Barrayar again now! Cold that shadow be the shadow of the future Miles? It’s a mystery! 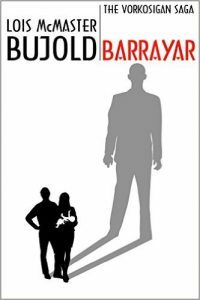 Last year I realized I had lost touch with Bujold’s writing and was significantly behind, so I undertook a massive binge and read everything she’s ever written back to back. It was a lot of fun, and gave me some interesting perspectives I might not have otherwise gotten. For example, I found it surprising how often she had young women falling in love with older gentlemen. That’s a relatively unusual trope. Those covers, though! OMG! One thing about Kindle is that I don’t really pay attention to covers, which is just as well given how awful most of those are. She does it well, though, doesn’t she? The Fawn-Dag romance could have bothered me in other hands, but Bujold made me believe it. And yes, I’m dramatically more likely to buy a Kindle edition if I detest the cover. Yes, she does it quite well! Far better than most fantasy authors, really. I was thinking about that a lot with her latest Vorkosigan Saga book where she did some retrofitting on the timeline, but I was willing to buy into it. It fit well with the idea that the series had been from Miles’ perspective for quite a while, and moving back to Cordelia’s perspective is rather different. Kids don’t see every side of their parents’ lives. It was nice to see a romance between older characters there. And I agree completely that she handled her may/december romances very well. That could be a touchy subject, but it came across as convincing, romantic, and touching. This one isn’t my favourite of the e-covers; I like most of them quite a lot. I can’t find the one blog post where she has all 17 covers at once, but several of them are on this page of her blog: https://www.goodreads.com/author/show/16094.Lois_McMaster_Bujold/blog?page=9. Thank you for sending me to her blog to look for those: I had missed the release of her new novella, Penric’s Shaman. More Penric and Desdemona, yay! I don’t reread Bujold in any kind of order anymore: the books are scattered around my house and I tend to pick them up and open them randomly whenever I’m feeling a bit down (or when I’ve been reading something badly written and I need a palate-cleanser). 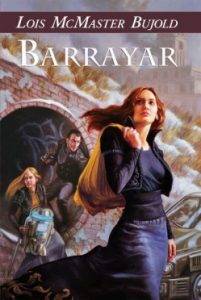 Yes, the Tor cover is the best, although Cordelia looks misleadingly non-lethal (we all know what’s in the bag). 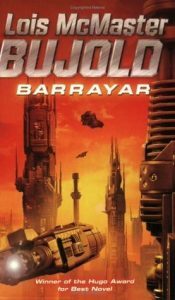 The Vorkosigan series have had a few non-attractive covers over the years. Luckily for me, my first encounter with LMB’s work is “Cordelia’s Honor” and then after that I didn’t pay attention to the covers at all. The white cover and the one on your copy looked like they were done by artists who didn’t read the book or were given bad briefs by whoever commissioned the artwork. Kootch, yes, I thought the bag was a particularly nice touch — since as you say, we all know what’s she’s got in there. Kim, frankly, I think that white cover is just pretty bad no matter who was involved with designing it. Who IS the shadow supposed to represent? It doesn’t matter that there’s a discussion about the cover that might answer that question; it shouldn’t be a question at all. And I just really think the cover gives entirely the wrong feel for the book. But now I’m interested and will definitely go look at the other ebook covers from your link.